Well, it’s been a while since my last post and I can safely say that I have really begun to adapt to these Maran days. I also have to say that this is a more expectable speed for my posts in the next couple of months. It has been in no part a lazy or slow last couple of weeks, but many of the things that have happened most recently have become, or will become part of my regular routine as I spend my year here. Needless to say I am very much enjoying my days, learning a lot and staying very busy as I become a part of the larger community here. It is extremely strange to think that I have been in Maran for almost two months now and been in Malaysia for nearly three. Time now seems to be moving rapidly as I can start to get a grasp on the overall duration of my stay in Malaysia. Ten months seems like a real figure now as three have already melted away. My time here is relatively short, and I can already see the effects of my yearly planning as weeks and weekends fill up with events, traveling and special celebrations. A real sense of time—being present in-time—has developed in me, and I am making a habit of booking my days until midnight and waking up at 6:00AM the next morning for school. I have full days, but not always of work—or work as I generally think of it. My days are full of teaching classes, running clubs, coaching football (soccer), lesson planning, playing badminton, chatting with students around town, and going out for teh with some of the local men of Maran. A lot can make up a typical day in Maran, some things very familiar, others strikingly different, but let me try to give a feel of what a day can hold. As I pull up to school on my bike I am generally greeted by a host of smiling and giggling faces. They tell me I look enormous on my bike, but I’m pretty sure that’s only because I’m the only person over 6 foot they’ve ever seen riding a bike, and probably the only white person too. That being said, I am proud to announce that I have been given a new nickname around town: “Gagasi Puhti” which means, “great white monster”. I know for a fact that that I am the biggest, whitest, hairiest man most people have seen on a regular basis, and I’m pretty sure that no one in town thinks that I am mean or that I do terrifying, unspeakable, monstrous things…..I think it’s just a term of endearment…. I will take it. It’s better than being called a random celebrity like Harry Potter, Clark Kent, or Peter Parker; other names that I get on a regular basis probably just because I have brown hair and glasses, and they do too. While at school I typically get assailed in the morning by younger students that want to speak to me so badly, but their English is just not quite there yet, so each meeting is concluded in laughter and jokes in Bahasa Melayu that I don’t understand. I generally try to scuttle my way about school in the morning so that I do not cause a scene and that I do not distract students from their other class, or so students don’t come up to me asking for me to take pictures with them—yet another endeavor I am rarely successful at; if I’m wearing a Baju Melayu forget about it, I might as well come in wearing a clown uniform and blaring a siren. The attention is a bit too much for me, but it is beginning to calm down, I think. My typical day of class consists of about four classes each about 60 minutes long. I am teaching the students how to comprehend and speak English confidently so I try to do a lot of interactive things and presentations in all of my classes. I do not have to teach to any syllabus, so I basically can hold classes on whatever I want to focus on or practice whatever I think the students need to work on. With each class this is of course different and perhaps difficult, but I view myself there as a quest lecture, filling students in on issues of the time, all while trying to relate Malaysia and it’s people to the US. Students have reacted very well to my lessons and particularly love it when we play short games, tell them about my family or friends in the States, and when I sing. All classes are different and have strikingly different English levels. In some of my younger lower level classes my students have a very hard time understanding anything I say in English—this is difficult. But other days I go to the Form 6 building in town where I teach the equivalent of college Freshman of ages 19,20, and 21—these classes are particularly fun as I can do most things with them and they even understand my sarcasm and jokes from time to time. As a general rule I always try to have fun in the classroom so that students and view English language learning as something positive. Another crucial aspect of my teaching is to try to reiterate every day and every period that English is something that is extremely beneficial if not absolutely necessary to be successful in any job after completing school. English is linked to Malaysia’s prosperity and development. Overall, I really enjoy teaching. Even the really tough students to teach are trying so hard to understand me and do the tasks that I ask of them. It is really one of the most rewarding experiences of my life. The amount of trust and respect that I get in the classroom is literally unreal, and unlike anything that I have received in the US. Occasionally, I will teach students something really ground breaking, like how to form an essay, or how to conduct a process of elimination while taking a test, or about how democracy works, or what freedom of speech is, or about global warming, or what WWII was about— major things that I would generally just skim over in the States because I assume that someone at some point has already taught them the foundation, but it will in fact blow their mind. Such moments are staggeringly consequential to me and I can at the least say that they are taking in something new and very profound. Moments like that make teaching the most worthwhile activity I could spend my time doing. If I could simply teach my students about those above points my year hear in Malaysia would be a wild success. Unfortunately however, I also have to teach my students a lot about the basics of spelling and grammar—something I might be the worst well equipped to do (example: I misspelled the word “occasionally” wrong in this paragraph twice before using spell checker). Apart from teaching my classes, which I adore, I spend some considerable time just sitting and talking with students around the campus, maybe playing some chess or joining in on some PE games. I also spend a lot of time socializing with teachers, which is also really fun. I have been so blessed as to be put into a school where all of the teachers and administrators are glade that I am there and want to use me to help in their activities. What’s more is that I have been so fortunate to have a number of socially outgoing male teachers that will spend time with me. All the female teachers are great too, but it is not necessarily appropriate for me to be talking or sitting with them. I generally sit at the canteen with the male teachers for a while and talk about just about everything as we eat our daily breakfast of rice, chicken and various spicy vegetables (I even had cow lounge for breakfast yesterday…a first). 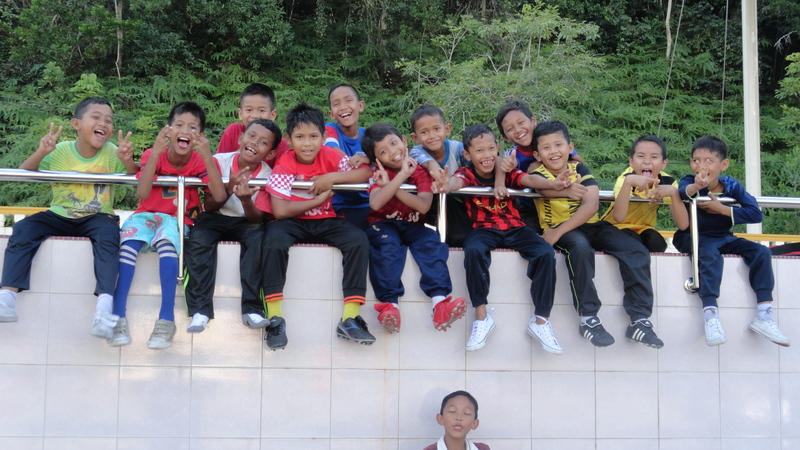 They teach me some Malay every day, I teach them some English, and it’s a perfect system. After spending some time in the teachers’ lounge or, “Bilik Guru”, planning for the next day, I hop back on my motorcycle and try to beat the scorching afternoon sun back home to my apartment (this is never accomplished). That being said, I have never sweated so much while just standing or sitting or sleeping in my life. The choking heat and humidity are inescapable and even fans do little to blow away the swelter from your skin. Consequently, I may or may not have driven to the local grocery store multiple times after school just to walk into the air conditioning and not buy anything. But regardless of the weather my after school activities usually take me outside where I am now coaching football (soccer). We meet every day for practice and even though I have not played soccer since I was in 7th grade they have made me an assistant head coach of two pretty good teams of guys, one being under the age of 15 and the other under the age of 18. Despite the heat, these students usually come out and break the stereotype of Malaysians being lazy or unathletic. They sweat it out under the unrelenting sun for nearly three hours every day and complete all of my inhuman conditioning drills almost without complaining, almost. It is extremely fun and for some reason the students think that I am some kind of football phenom, but I generally don’t play at all due to fear of “losing face”. Coaching is really fun and it is a great way to work on English language skills outside of the classroom. It might just be my favorite part of the day. If I am not coaching football however, I usually am participation in some other co-curricular activity. I have now started an English debate team here at school and am working with a few select students on parliamentary style debating. These students will be the ones I will probably invest most of my time in as we practice every week and hopefully their confidence and English capabilities grow drastically during my time here. 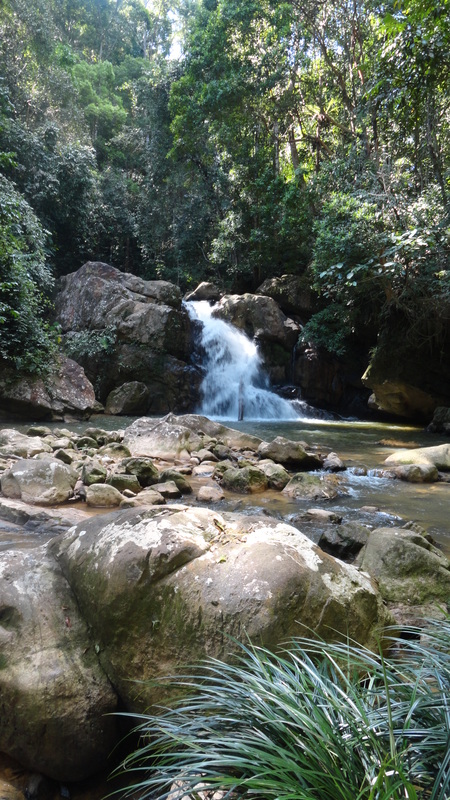 This week I did something totally different however, and took a group of Form 6 students on a hike to some local waterfalls with an exchange group from Singapore. It was extremely hot but very rewarding to challenge some of my students and have them complete tasks that are pretty uncharacteristic for them, namely, meeting new people and exerting themselves in exercise. A lot of my time after school is often spent just playing with the local kids—this is really funny. I am an absolute celebrity when it comes to the youngest ones in town so I make a point to talk to them and play things like football, or Takraw (a game a lot like volleyball, but only played with your feet and head). But, as one of my hardest undertakings, I have decided to tutor two local boys in English and it easily provides most of the humor for my week. To say that these two boys are naughty would be too nice. They give true and fulfilling meaning to the word “Hell-raisers”. I might put them in the running for the least well behaved children you’ve come across. It’s humorous how bad they are—so bad that I am powerless and can only laugh at what is happening while I grasp for a handle on the situation. I’ve never seen children intentionally try to break, everything: they do. I’ve never seen children systematically inflict pain on their sibling for no apparent reason: they do. I’ve never seen children laugh so hard after they injure another: they do. They come into our house on a mission to displace or ruin things. I could tell you countless near disastrous stories about these boys, but it would be wasted space, especially since last week one of them upended their entire water bottle onto my computer. I need to send these posts while I still can. We also attend the gym pretty frequently. I use the term gym lightly because it has a few dumb bells a bench press, and a couple of treadmills that don’t work. This is a really good place to boost self-esteem because just about everyone there thinks I am the strongest man on earth. It’s always a ridiculous time. Even more evenings however, are usually spent socializing with fellow teachers, if I feel up to it after tutoring. The men of the town have really taken a liking to us and it is really fun to go out to tea with them most nights. That being said, I rarely pay for my evening meals, which is great. We generally sit and drink some Teh Tarik, Kopi or eat (others smoke….everyone smokes in Malaysia) and we talk about all sorts of things until pretty late into the night. I would say that I am way more social now than I have ever been in my life, which is good for me I guess. But I typically go to bed around 12:00AM and try to sleep until 6:00AM. Some more notable things that have happened lately include my first real English Camp experience. My roommate and I arranged for our two schools in town to have a day camp together focusing on English games that would mimic the Olympics. Organizing took quite a bit of work, but It was a wildly successful. We organized the day to include two main sessions and have about 120 students with the help of 10 ETAs from around the area. The students had a great time competing in the games and we got to teach some valuable English and even cleaned up some of the public camp grounds while we were at it. It was a good community event and the only thing that the students and teachers loved more than the camps activities were the ETAs. Every female and male ETA that visited my students has about 100 secret admirers. I am continuing to learn much while I am turning out the days in Maran and I hope this will continue. Viewpoints on faith, religion, love, marriage, civics and race are all pretty different. And I am adapting to learn the norms. I usually just listen or watch when people talk about such things, but I always come away with a stronger sense of clarity in the values that Malaysians have. Some things that are different here in Maran include: Men of Islamic faith are capable of having 3 wives if they can afford it. The mandatory category of race is on every official document that you fill out, right next to your name. All teachers are government employees and are subject to the governing party’s agenda. Students complete nationally standardized tests just about every couple of months. Religion, particularly Islam is intertwined with just about every activate completed throughout the day. And bathrooms typically have about 1 inch of standing water on the floor at all times as a display of cleanliness. Not my favorite. As a general rule I don’t use public bathrooms, and touch nothing when I do. 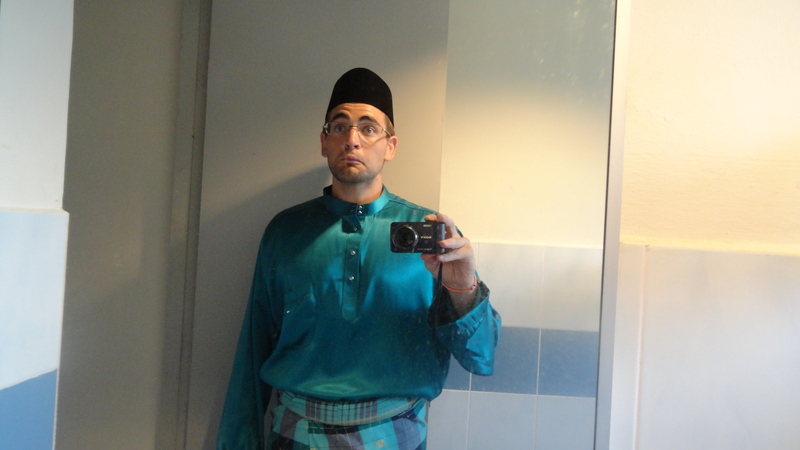 Me in my Baju Melayu. It is never my intention or role to judge or try to provoke change in any of these things—simply, to learn and tell others of my experiences here living and working with the people of Maran; that is my main objective every day. So far, I am enjoying it immensely and finding fresh and interesting things at every turn. I remarked that all those whose opinions are decidedly repugnant to ours are not on that account barbarians and savages, but on the contrary that many of these nations make an equally good, if not a better, use of their Reason than we do. Posted on March 22, 2013, in Uncategorized. Bookmark the permalink. 3 Comments. Prayers and laughs as I read your posts. You da bomb. Will be remembering humid sweatflops as we gather at Grandma and Grandpa’s next Easter Sunday in the shivering cold. Easter joy to you in the midst of Hindu and Muslim hospitality. Michael the white hairy monster getting off of his “ride”…I am still laughing with tears in my eyes. Thank-you for that! You take care and keep making memories for you and the students. Mrs. R.